A vehicle fire on the A27 is causing rush hour delays. Sussex Roads Police tweeted to say that the fire happened earlier on the eastbound carriageway of the A27, at the Hangleton bypass near Portslade, closing lane one of two. 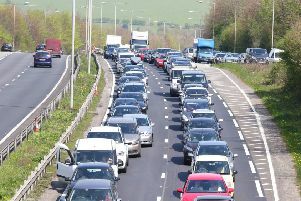 It is having a knock-on effect on traffic in this direction, with tailbacks all the way to the Shoreham bypass and average driving speeds of 5mph. Emergency services and recovery vehicles are at the scene.